Officers in the women’s wing of a large urban jail call down to medical asking for assistance with an out-of-control inmate. The 22-year-old woman was booked in 10 days ago and was successfully withdrawn from alcohol during the first week. Now the officers describe her as totally out of control, hearing voices, and bouncing off the walls. As preparations are underway to do a cell-side evaluation, a Man-Down is called for the same wing. The emergency bag is pulled and the designated emergency nurse asks a second nurse to accompany her to the floor. They find the woman unconscious on the floor of her cell. The officers state that just after they phoned medical, the woman began to shake, her eyes rolled back, and she collapsed on the floor. Health care staff at this jail did a good job of withdrawing this woman from alcohol. They used a standard withdrawal protocol based on the Federal Bureau of Prisons Guidelines that included scheduled evaluations using the CIWA-Ar and administration of lorazepam (Ativan) based on scoring. Within 4 days she was symptom free and CIWA evaluations ended on Day 7. 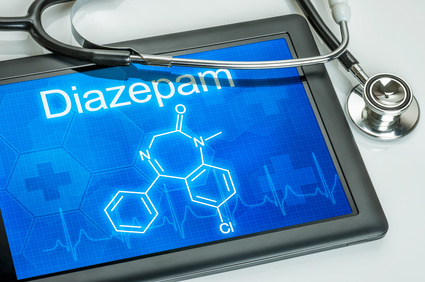 However, intake screening questions missed this patient’s heavy dependence on diazepam (Valium) along with her alcohol intake. The benzodiazepine treatment for alcohol withdrawal held off drug withdrawal symptoms until later in her stay. Benzodiazepines are rarely misused alone. As in this case, they can be combined with alcohol abuse. In other situations they may be used in conjunction with opiates or cocaine. Women are twice as likely to misuse benzodiazepines as men. 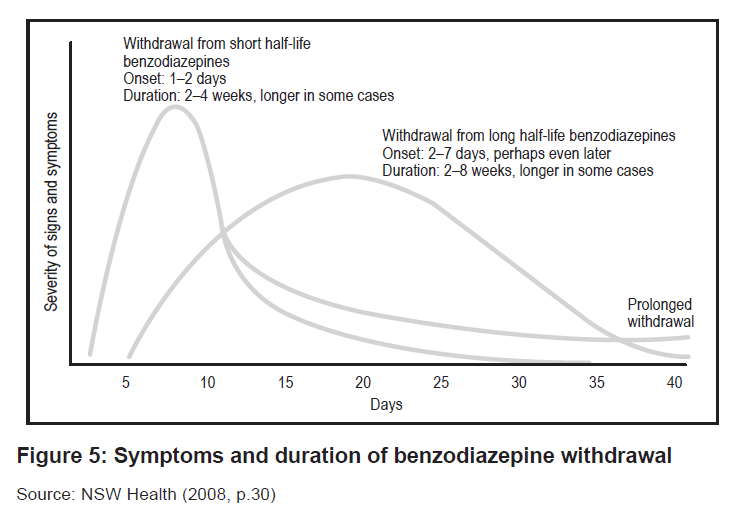 Long-acting sedatives like diazepam may take longer for withdrawal symptoms to emerge, as indicated by this graph. Depending on your geographic region, you will hear many names for street drugs. Keeping up with the lingo is an important part of assessing for benzodiazepine dependence or misuse. Here are some common street terms for this drug class. Do any of these sound familiar? Benzodiazepine withdrawal is a hidden trouble that is often mixed with other drug and alcohol withdrawal issues. Be particularly alert for this potential with female patients in combination with other primary concerns such as alcohol and opiates. What are you using to screen and assess for benzodiazepine dependence? Share your thoughts in the comments section of this post. This entry was posted in Withdrawal and tagged correctional nursing, Essentials of Correctional Nursing, Lorry Schoenly, Withdrawal. Bookmark the permalink.